The Pulkovo airport memorial devoted to the 224 passengers who died on the flight from Sharm el-Sheikh, Egypt to St. Petersburg on Oct. 31. It is no an accident that ISIS chose to strike at Russia not at home, but abroad, by downing a plane in Egypt. Officials look for ways to stop the influence of Islamic State along Russia’s southern borders. On the eve of the Paris attacks, ISIS extremists published a video in Russian: “Soon, very soon,” it said, “there will be a sea of blood.” Experts believe ISIS is indeed a real threat for Russia. 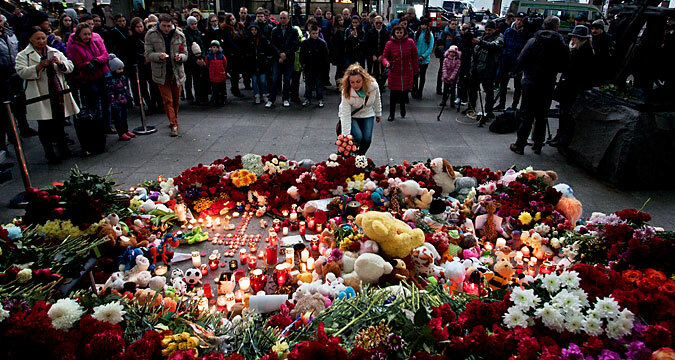 On Oct. 31, a Russian plane exploded, killing all 224 passengers on a flight from Egypt to St. Petersburg. On Nov. 20, six Russian citizens were killed in Mali during a terrorist attack. And although ISIS has so far only hurt Russians abroad, Russia has a turbulent history with its own majority-Muslim regions in the south, and is itself not immune to large-scale terrorist attacks. “Penetration into our territory is very possible,” said Sergei Goncharov, president of the International Association of Veterans of the Alpha anti-terror subdivision. But even in light of recent events, the threat should not be blown out of proportion. “We have sufficient experience in reacting to such challenges and threats,” said Russian Minister of Interior Vladimir Kolokoltsev. Russia’s weakest security points are the Northern Caucasus and the southern borders of the former Soviet republics, where experts fear Muslims rebuffed from mainstream society will look to extremists for answers. Of the country’s 16.5 million Russian Muslims, ISIS may have up to half a million sympathizers, according to Alexey Malashenko, chair of the Carnegie Moscow Center’s Religion, Society, and Security Program, in an essay published on the center’s website. These Russian Muslims might be averse to terrorism, but they’re seeking a Muslim-centric form of government, Malashenko wrote. “It is an appealing idea, when contrasted with Russia’s economic crisis, corruption and growing inequality,” Malashenko wrote. As of Sept. 18, some 2,400 Russians are fighting for ISIS, and almost 3,000 citizens of Central Asian countries are also participating, First Deputy Director of the Federal Security Service (FSB) Sergei Smirnov told Interfax. The Northern Caucasus has long been a region of unrest, with roots of insurgency reaching back to the 18th century. The most recent conflicts flared after Chechnya declared independence from Russia in 1991, instigating the first Chechen War (1994-96). A short cease-fire lasted until 1999, when the Second Chechen War began. By early 2000, Russia had almost completely destroyed the capital city of Grozny and regained direct control of the republic. In 2009, Russia officially ended its antiterrorist operation, although low-level insurgency has continued, most notably in Chechnya, Ingushetia and Dagestan. Terrorist attacks throughout Russia have been attributed to radical Islamists from the North Caucasus: the Russian apartment bombings in 1999; the Moscow theater hostage crisis in 2002; the Beslan school hostage crisis in 2004; the 2010 Moscow Metro bombings; and the Domodedovo International Airport bombing in 2011. The victim tally for these attacks alone reached 849. Meanwhile, Russian security forces have created a system for countering terrorism in this region. In Dagestan, where not long ago there were monthly explosions and shootings, there have been no terrorist acts for practically the last two years, points out Ivan Konovalov, Director of the Moscow-based Center for Strategic Affairs. In late November, Russian law-enforcement agencies eliminated a local gang affiliated with the Islamic State in the North Caucasus. The special operation Nov. 22 in the Kabardino-Balkar Republic by FSB officers neutralized the largest number of militants in recent months: 11 individuals killed. The gang was allegedly assisting locals who wanted to fight alongside ISIS by helping them travel to Syria, as well as plotting terrorist attacks in the North Caucasus. The special services in the Caucasus and the governments in each republic have the main objective to prevent terrorist acts, according to Konovalov. “ISIS also understands that if they do something large-scale, the governments of the Northern Caucasus will immediately start crushing them from all sides,” Konovalov said. Security services and border control in countries such as Turkmenistan, Uzbekistan and Tajikistan leave much to be desired, according to Goncharov. However, Russia does not share a border with these countries, and its longest border – with Kazakhstan – is guarded and closely watched. Also, before reaching the southern borders of Russia, the militants would have to cross parts of Turkey, Armenia and Georgia, according to Alexei Fenenko, collaborator at the Institute of International Security of the Russian Academy of Science. “This is not as easy as it seems,” Fenenko said. At the National Anti-terrorist Committee (NAC) meeting in mid-October 2015, FSB Director Alexander Bortnikov said the special services have prevented 20 terrorist crimes in Russia this year. “One of the last example is the detainment of 12 Russian citizens in Moscow on Oct. 11 who are members and accomplices of the international terrorist organization (Islamic State) and were preparing a terrorist act on public transportation,” said Bortnikov, who is also head of the NAC. Observers believe that from now on, the special services’ efforts will be aimed at finding terrorist cells and recruitment centers, which are expanding outside of the predictable zones. Varvara Karaulova, a student at one of Moscow’s best universities who has been accused of trying to join ISIS, exemplifies the wide-ranging influence of extremists not only in the unstable Caucasus, but in well-off Moscow. However, Karaulova was linked to Islamic recruiting structures that the special services should have been aware of, according to Mikhail Alexandrov from the Center for Political-Military Analysis at Moscow State Institute of International Relations. Are the main threats outside Russia? It is no an accident that ISIS chose to strike at Russia not at home, but abroad, by downing a plane in Egypt. Within greater Russia itself, the Islamists cannot count on any serious support, but they can be sure of one thing: that Russia will mobilize all its forces to counter any domestic attacks. In the end, experts note, Russia is not a very convenient enemy for ISIS, and this threat – while real – should not be overestimated. Meanwhile, Alexei Fenenko thinks that ISIS’s main threats are tied to the possible destabilization of Turkey, which in turn would destabilize the entire Caucasus and strengthen ISIS in Afghanistan.